Awhile ago I wrote a blog about developing on SAP HANA and recently SAP announced during the Las Vegas SAP TechEd event the addition of SAP HANA, express edition. 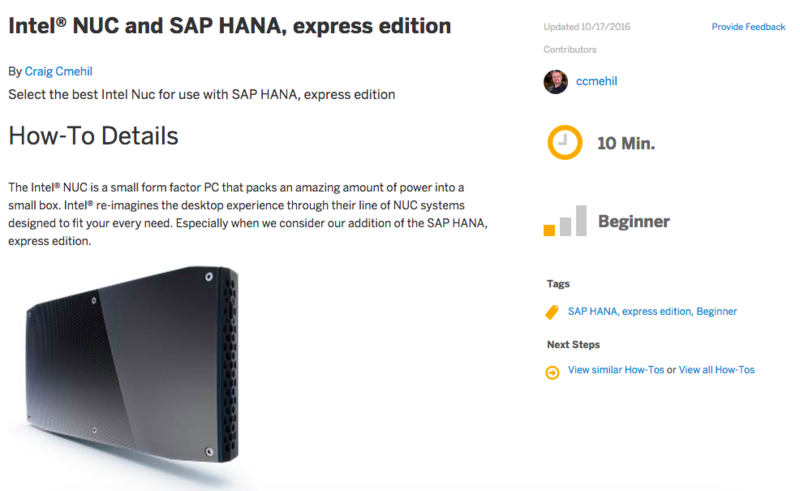 So I decided I would take on a little project to expand my first blog and share my experiences with the new SAP HANA, express edition (HXE). To kick this off I decided I would tackle it in steps and share those steps along the way. The first would be a How-To guide on deciding which Intel Nuc I would use for my HXE installation and then follow that up with getting my Intel Nuc ready to use and then putting HXE onto the system. Finally my first foray into the HXE world with a little bit of PHP and SAP HANA perhaps? More to follow of course! My first tutorial is now live and the second is underway, the first you can find within the how-to’s of the Developer Center. To access it you can either head to http://developers.sap.com and then click on “Tutorials” or jump straight to the guide. I’m really looking forward to the next steps and I hope you follow along with me, for me personally this feels like the old days when I first got my hands on SAP NetWeaver WebAS 6.20 system. Have a look at the How-To, I’m still working on the next pieces so if there are questions now is the time to get them in there so I can adjust accordingly and answer as many as possible! Sure looks like our “MiniWAS” adventures! Looking forward to the remake.